Auburn’s 26-14 win over Alabama on Saturday has turned the NCAA football playoff rankings upside down. The 10-2 Tigers are now ranked second in the nation, while Clemson has moved up two positions into first. Meanwhile, Miami’s shock loss at the hands of Pittsburgh has ruined a perfect season for the Hurricanes. Only one undefeated team remains in the top 10, and that record is owned by Wisconsin. The Badgers have finally moved into the playoff top four. But will they be there at the end of the season? In the latest NCAA football futures, Oklahoma possesses the best odds. The Sooners come in at +400 to win the National Championship. Oklahoma is followed closely behind by Alabama at +425 as bookmakers still believe the Crimson Tide can get into the NCAA Playoffs. Despite being undefeated, Wisconsin can’t get any love from bookmakers. The Badger have shown they are highly capable of winning football games. It seems odds makers need to see Wisconsin beat Ohio State on Saturday to be convinced. Wisconsin is 12-0 for the first time in school history, but making it into the NCAA Football Playoffs depends on whether or not it wins the Big 10 title game. Despite Wisconsin’s great season, Ohio State comes into the game as the favorite. In terms of the spread, Wisconsin is 5-1 against the spread in its last six games. Wisconsin has the best defense in the NCAA, but the school has been criticized for having a weak schedule. Therefore, sports books and NCAA analysts aren’t giving the team much respect. 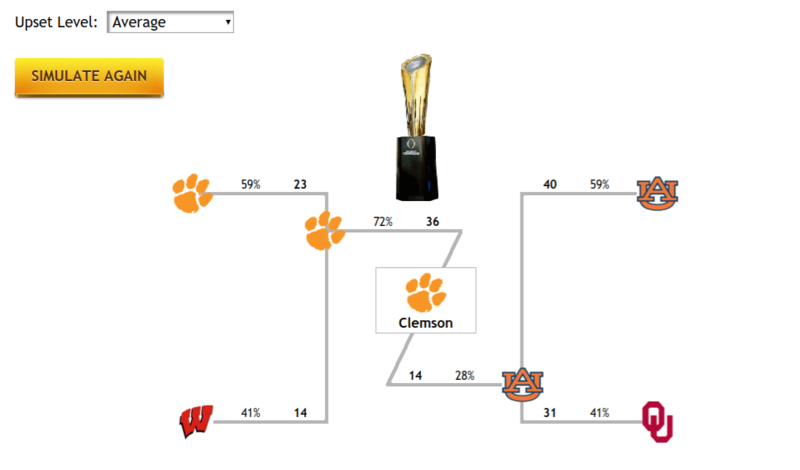 Using the handy ZCode System’s Playoff Simulator, we can see that Clemson is predicted to win its second straight NCAA National Championship. The Playoff Simulator has Auburn playing Clemson in the final. While Clemson is getting the nod from the Playoff Simulator and is loved by college football analysts the world over, the Tigers must still win the ACC Championship Game on Saturday. Clemson will have to overcome Miami on the neutral field of Charlotte, North Carolina. The Tigers are 9.5 point favorites ahead of the ACC title decider. A Miami win will once again send shock waves throughout college football. Theoretically, Clemson and Wisconsin could both lose, and fall out of the playoff rankings. Oklahoma could be a big winner on Saturday in terms of rankings. Yet, the Sooners must beat No. 10 ranked TCU in the Big 12 Championship Game. Oklahoma has already beaten TCU this season, 38-20, in Norman. However, the Big 12 Championship Game will be played slightly closer to home for TCU at AT&T Stadium in Arlington. 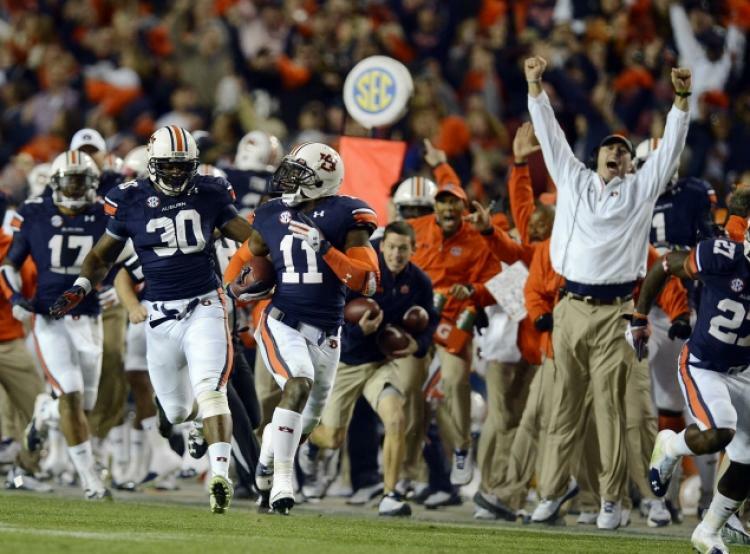 Of course, Auburn needs to win as well to maintain its current ranking. The SEC Championship Game will pit the Tigers against former No. 1 ranked team, the Georgia Bulldogs. It is an unenviable weekend for the top ranked teams in NCAA football. In theory, all higher ranked sides could lose, and the playoffs would be thrown into chaos.